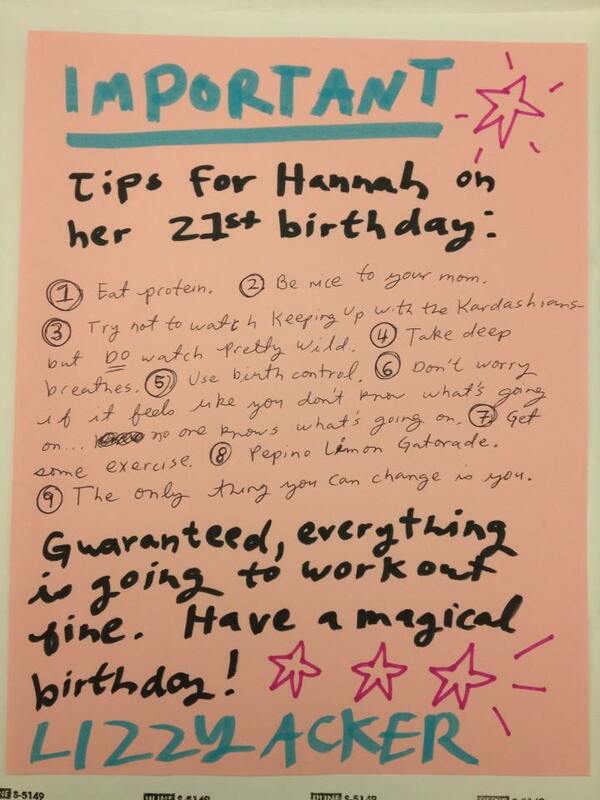 Important Tips For Hannah On Her 21st Birthday – Lizzy Acker! A couple months ago I got an email from a stranger who told me her friend was a fan of mine (?!) and was about to turn 21 and could I do something for her. I waited a healthy amount of time (like say 10 minutes) and responded back OH MY GOD YES OF COURSE (trying and failing to play it cool). And then I made the nice girl, Hannah, this. Maybe a month after that, Hannah came up to me on the street! She recognized me and wanted to say thank you! I don’t know much about her besides the fact that she is now 21 and is my favorite person, but I don’t think she will mind too too much if I share her tips with the world. I stand by all of these and should probably continue to work on a couple of them myself.